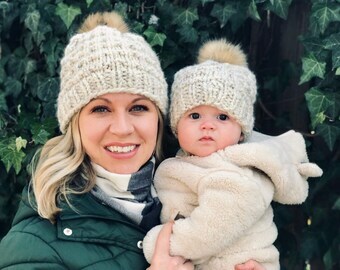 Pom Pom Hats for Baby and Mom. Knitting Patterns too! Announcement Happy Valentine's day, and welcome to Tinker Creek Handknits! In my shop you'll find accessories to keep babies, toddlers, kids and adults cozy and warm this winter, using natural wool and acylic fibers. I design most, and hand knit all items in the shop. Knitters, I've written up the patterns for most of the handknits, which are also available in the shop. Follow me on Instagram @tinkercreekhandknits for fun pictures and shop updates! Happy Valentine's day, and welcome to Tinker Creek Handknits! This is my second purchase from TinkerCreek-these hats a lush and thick. I gave these matching mommy/baby hats as a baby shower gift and everyone LOVED them! Darling knit cap, tightly knit, quality yarn. It came early and wrapped with a big bow in a cellophane bag-all ready to give as gift. Lisa was very responsive and helpful! Bun Hats? We've got them! Just the beginning of several new listings for Bun Hats and Pom Hats! Come look and find something to keep you warm... it's snowing here in the Blue Ridge of Virginia as I write! Knitters?? 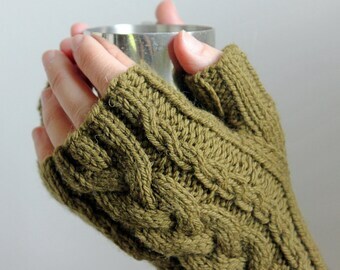 The knitting pattern for the soft and squishy handwarmers is in the shop! Lots of photoshoots are happening at Tinker Creek Handknits as we bring out the cabled knits - matching hats and mitts - and list them in the shop! Amie (my 13 year old) has been taking a lot of pictures for the shop and insisted on a shot with our cat. Ana, Amie, Lauren and me. ...And sometimes our cat wants to join in the fun at photoshoots. A stack of Tinker Creek Handknits waiting to be shipped. Every order includes a Tinker Creek Handknits tag with instructions on how to take care of your new knit accessory. I design hats, gloves and headbands knit from all-wool and wool/acrylic blend fibers. I learned to knit 20 years ago and I'm in love with natural fibers, especially wool. There is nothing like wool for keeping you warm and dry in all kinds of weather. When I began to have children, I noticed that few clothing stores carried clothes and accessories for kids that were made of wool. 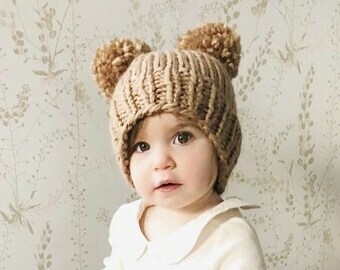 So, I began designing handknits and writing my own knitting patterns to make childrens' hats, gloves, mittens and other accessories made from wool. This became my passion, especially when my children actually liked the products and wanted to wear them! Now, I design wool acrylic/wool blend accessories for both kids and adults. I love the challenge of creating original designs that are classic yet contemporary for kids, tweens, teens and adults. 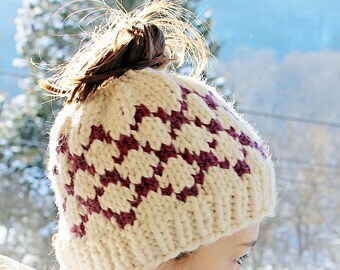 I design and knit all the hats, gloves and ear warmers in my shop with input from my 3 daughters, ages 12, 13 and 16. When you choose to buy a product made from natural fibers, you're choosing to support a sustainable, environmentally-friendly industry. If you buy a handknit from me, you are also choosing to support local handmade sellers right here in the United States. And for that, I thank you! I hope you enjoy looking around my shop, and please contact me with any questions or comments you may have. I look forward to hearing from you! All of the items in my shop are handknits that have been designed by me. I have written knitting patterns for many of the items, which are available in my shop. When you purchase this pattern you are agreeing to use it for personal use only. You do not have permission to sell the item the pattern creates. You may not copy the pattern or distribute it. You may print one copy for personal use but may not print multiples to distribute, nor may you share the digital file with others. Please direct your friends to this store so that they can purchase their own copy. All the handknits in my shop are made from all natural fibers, mainly wool and alpaca. Items should be handwashed with mild soap. Gently squeeze out excess water; do not wring. Re-shape and air-dry flat. Do not tumble dry.